If you are trying to plan a romantic evening with your loved one, why not look into a dinner cruise in MA. Browse through our in-depth guide to the best dinner cruises that you will find in Massachusetts. Enjoy beautiful scenery and a fantastic meal while getting the intimate evening you've been looking for. If you're looking to celebrate a birthday or special occasion on dry land, visit KidsParties.Party. They feature restaurants in MA that offer party packages for all types of events. Odyssey offers you the most exciting way to enjoy your day with friends and family. 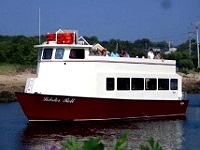 They are one of the biggest and finest dinner cruises of MA. They ensure a wonderful environment to enjoy lunch and dinner and tour the whole city. The cruise is even good to celebrate your occasions. They offer special deals for group celebrations. 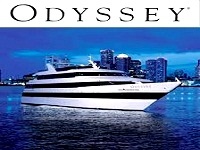 For weddings, school events and for a holiday party or tour it is an awesome decision to go with Odyssey. You may check out their webpage for more details or to know about their event menu. Pilgrim Belle Cruises is a wonderful option to travel with and for dinner. They offer special events to celebrate and ensure a wonderful party environment to enjoy your party. Their available hours are 9:00 am to 5:00 pm from Monday to Friday. People that enjoy dinner cruises or want to celebrate a wonderful cruise party may contact Pilgrim Belle Cruises. The cruise is in-fact a great option to arrange any small wedding party or to hire for any special occasion. 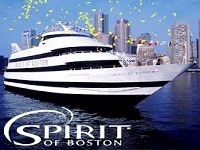 Spirit of Boston offers the best fun with exciting dining, dancing, yummy foods and spectacular views. They are one of the biggest and best entertaining cruises of Massachusetts. They offer grand buffets with an eye-catching view of Boston and provide DJs to rock your party. 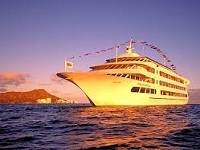 The cruise is also wonderful to celebrate birthday parties, weddings, for a large corporate party or more. You may look at their webpage for more info about the cruise and their available hours. 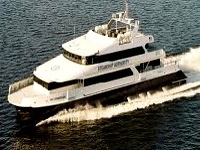 Boston Harbor Cruises offers you the best experience of fun and excitement. They provide the best and most exciting cruises for fun like a sunset cruise, tea party cruise, lighthouse cruise, daily luncheon cruise and more. For parties, weddings or for a private celebration their cruises are just awesome. 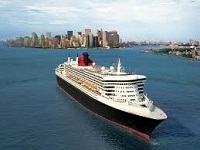 To enjoy the wonderful view of Boston and have fun with great food and drinks the cruises are really stunning. You may check out their webpage for available hours and ticketing info. Lobster Roll Cruises is a wonderful place to have fun and eat yummy lobster. They arrange lunch, dinner even sunset dinners and more to enjoy with family and friends. They are even good to arrange private parties, birthday parties, anniversaries, weddings and more. To have a wonderful lobster dinner with drinks and wines and many more yummy items and to have fun on a cruise Lobster Roll Cruises is truly awesome. You may check out their webpage for more information. Harbor Queen Cruise offers to arrange the best event and fun on the water. To have a wonderful day with family and friends even with yummy food items and fun the cruise is truly amazing. 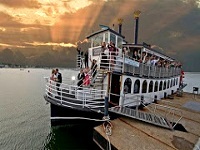 To arrange exciting corporate parties even wedding parties or cocktail parties on the water, Harbor Queen is now the best option for all. The cruise has the capacity to carry 150 passengers for events and parties. They also offer lunch, dinner and travel all around Narragansett Bay. You may visit their webpage for more details about the cruise and their party packages. 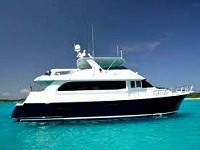 Defiance Sail Charters allows you to rent amazing charters for your parties or celebration of any event. To celebrate a wonderful wedding party, reunion even for birthday parties, bachelor parties or for more you may rent their charters. They also offer a reasonable price for renting, including dinner and lunch for their day charters or 3 hour charters and more. You may check out their webpage for more info or may contact them for pricing and renting. They ensure you the best quality charters to celebrate your party on. S & S Cruises ensures that you will enjoy the best cruise vacation. They offer the most exciting deals and low prices to make you comfortable. Some of their exciting ongoing packages are 2 nights for $259, 5 nights for $699, even a visit to an island and many more low and high cost traveling packages. For more details about their cruises and travel packages you may browse their webpage or contact them. They are really the best to offer you quality travel packages. Bay State Cruise is a wonderful option to have fun and entertainment. They offer summer music cruises for fun and provide private charters, cruises, student dance cruises and more. The company even ensures the best and most comfortable services to their guests. For parties, events or to celebrate any occasion, they are truly the best cruises to hire. You may check out their webpage for more details or contact them for party packages and more. They ensure you the best service to make you laugh and be entertained. 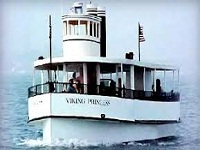 Viking Princess Harbor Cruises offers wonderful boats for rides and parties. They especially provide small boats certified to carry about 49 passengers. You may RENT their boats for parties, weddings, events and much more. They even allow you to enjoy their Harbor Tour, Critter Cruise, Live Music Cruise and many more. You may look at their website for more details about the company and their cruise service. Here you will also find the ticket price for adults and children and the hour duration.